BRAND NEW BEGINNER? This course was made with you in mind! Your discount price: Only $379- Now Only $297. blackbeltcourse.comShodan Blackbelt Course - Enroll now! 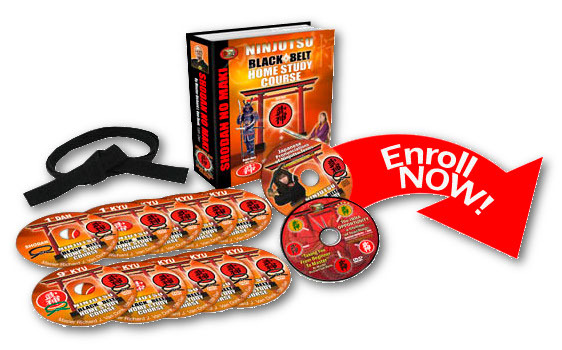 This powerful, life changing Ninjutsu BlackBelt Home Study Course created by world renowned Master Richard Van Donk, 15th dan is taught in a, “Here’s where you put this foot, here’s where you put the other foot, Lift your hands to this position,” kind of teaching. An A-B-C-D step by step fashion. Start simple and progress level by level as you train with each instructional video program. Take your time learning or speed along. You can even learn it by using it as your exercise program! It works. How do we know? Hundreds of satisfied people from 45 countries have taken our distant learning course who had NEVER trained in martial arts before and are now Black Belts!!! Many are high level Black Belt instructors who now have Black Belt students of their own. Here on ten (10) body-awakening DVD’s you will learn how you yourself can personally gain the legendary ability of being a martial arts Black Belt. The proof? On your very first Level 1 – 9th Kyu dvd you’ll actually begin to discover it for yourself — IMMEDIATELY — with YOUR OWN Body Actions! You will amaze yourself. You will receive the newest DVD Video Version + 4 FREE BONUS. Was $379- Now Only $297.